We're not ugly-crying. You are. Heidi Levitt, Tamlyn Tomita, Tsai Chin, director Wayne Wang and Kieu Chinh at the anniversary screening of 'The Joy Luck Club' at the Toronto International Film Festival on Thursday. Twenty-five years ago, "The Joy Luck Club" moved audiences to tears. And it wielded its sob-inducing power again at its silver anniversary return Thursday. "I cried the first time I watched it, and I made the film! Maybe it's this theatre," director Wayne Wang said at a special screening at the Toronto International Film Festival. The adaptation of Amy Tang's novel made its Canadian debut in 1993 at Toronto's Elgin Theatre during TIFF. 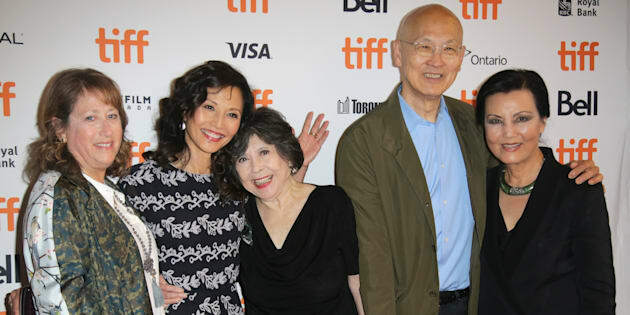 Wang came back to where it all started and reunited with some of the film's original cast members: Kieu Chinh (Auntie Suyuan), Tsai Chin (Auntie Lindo) and Tamlyn Tomita (daughter Waverly), and casting director Heidi Levitt. The generational tale is about the relationship between four Chinese immigrant mothers and their American-born daughters. It was a story that Hollywood had not yet told at the time of its release and really hasn't told again since. The film has been described as a token Asian Hollywood film by the New York Times, as it was only the second blockbuster to feature an Asian-majority cast next to 1961's "Flower Drum Song." The next major Hollywood film would come, coincidentally, 25 years later, with the release of "Crazy Rich Asians," a romantic comedy with an all-Asian cast that's won rave reviews and strong box-office numbers since its August release. So why the quarter-century gap between films? Wang didn't mince words in his response. "Because Hollywood is basically scared all the time," he said during a Q and A after the screening. "And ultimately, it's about money and how much money they make. That's the bottom line." "So what is important is for you to support these movies and not let these movies just make a hit and then disappear again, because these are your stories and they should be told." Tomita agreed with Wang. "['The Joy Luck Club'] was a modest success — $10 million budget, it made $35 million in total. 'Crazy Rich [Asians]' made $35 million in its first weekend, so there's the comparison," she said. "If the doors had opened [after 'Joy Luck Club'] I think you would have seen [us] starring in other movies and television shows, and that didn't quite happen." (L-R) Heidi Levitt, Tamlyn Tomita, Tsai Chin, Wayne Wang, and Kieu Chinh at the 'The Joy Luck Club' at TIFF 2018. It's no secret that people of colour are still underrepresented in film, and a common excuse for this is that there aren't enough of them in the business. But according to "The Joy Luck Club"'s casting director, this simply isn't true. "The talent was out there. The rules weren't out there," Levitt said about casting the movie. "[The film's stars] had all acted before ... the point is that there weren't enough roles where they were being recognized because they were made to play very small roles." Despite one film executive's doubts that the movie would find the right cast, Levitt said they made open calls and did the ground work, going into Asian-populated neighbourhoods and doing extensive searches to find their perfect cast. But representation in film is not just about casting the right people. It's about telling the diverse stories about people of colour, too. "We have to support everyone so their stories don't get 'invisibilized,'" Tomita said. "We don't necessarily have to repopulate the next Marvel movie with people of colour, but it's just about saying 'We have hearts, we have souls, we have minds, we have faults, we have flaws, and we're super-freaking interesting.'" In addition to speaking up, Wang also encouraged people with the means to put up their own money for Asian-focused stories to do so. "You can make films that are really powerful for limited budgets," he said. "We have to control our own destinies." The screening brought together longtime fans of the film with those who had never seen the movie before. "Kim's Convenience" stars Simu Liu and Andrea Bang were among those who watched the film for the first time on Thursday. Both were stuck by how resonant the story was in 2018. "I found it riveting and heartbreaking and beautiful. I was surprised by how the themes carried over," Liu told HuffPost Canada. The mother-daughter conversations particularly struck a chord with him, as both he and his female friends have had similar types of conversations with their own parents. "They were so nuanced and coloured," he said. "Even if it came out today, it would still be relevant," Bang added. "It had quality acting, people stories ... Why didn't I watch this earlier?" Moviegoer Jiamin Huang, from Scarborough, Ont., also saw the movie for the first time at the screening. The 25-year-old was born in China, but moved to Canada with her parents at the age of nine. "This is a much deeper movie than ['Crazy Rich Asians']," Huang told HuffPost Canada. "Where I come from in China, there are a lot of immigrants, so I've heard stories from my parents and grandparents even before I moved to Canada. I felt like when I was watching it... It put it all together. It was so cool to see it." Huang attended the screening with her friend Cindy Pham, whose mother is a huge fan of the movie. Pham first saw the film at the age of eight or nine. "It was a big nostalgia trip because I was thinking about my mom while watching it," the 24-year-old Torontonian said. "My parents were refugees from the Vietnam War and some of the themes from the film resonated [because of that]. It's also one of the first Asian films I've seen in the English language. It was the little things they did that reminded me of my family." "Watching it now is different from watching it as a kid," Pham added. "I understand the moms' side now. It gives a different perspective every time I watch it."